Now I'm fighting wiring. Put the adapter on the bike, all outputs are good. Add the converter, only the tail lights work. I took the converter back and checked a new one with my meter. Reads the same as the first one, so I bought a different type. Ill know something soon. Same problem with second converter. I had one 5 to 4 converter once, it didn't last long so I just converted everything to 5 prong. So much easier and gives me the ability to add a third brake light. What's this 'adapter' that you added to the bike upstream of the 5-4 converter?? 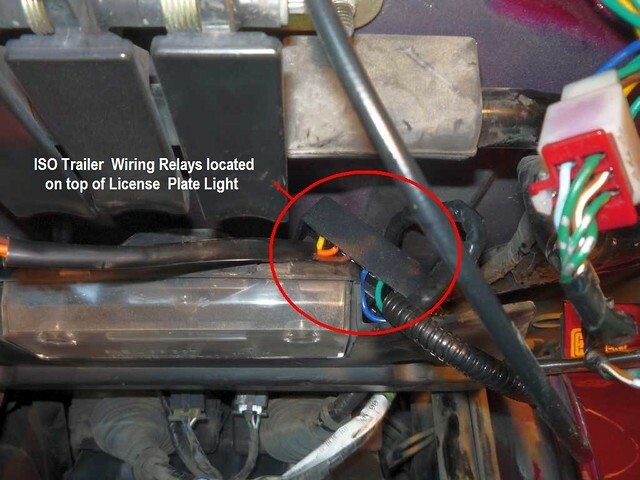 Are you meaning a ISO trailer wiring harness? 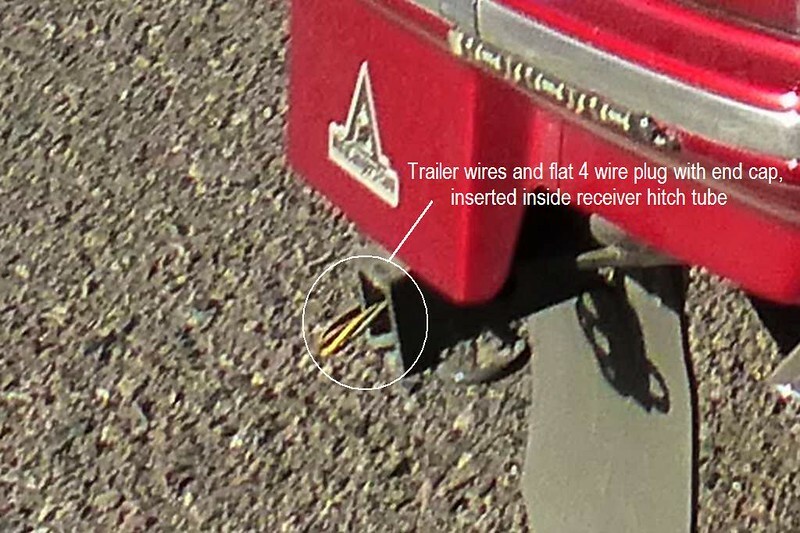 Usually trailer wiring problems are a result of poor/no ground, on both the bike side and/or the trailer side. When I built my cargo trailer, I got my bud to weld a nut to a hole in the frame, in which I ran a jumper from my wiring junction box's ground terminal to a bolt through that nut, so all the trailer lights had a very good ground point on the trailer itself. I then ran the trailer connector's ground wire from the connector to the ground terminal in the junction box. On the bike, I made sure the ground wire from that side of the connector ran back to a good ground in point on the bike. First thing I checked was ground. Added a jumper from harness ground to bike ground. By adapter, I mean the wiring harness. I used the isolated harness. Signal out of that is good on all leads. I've used these converters many times on cars, with no problems. Double and triple checked that I matched them up right. Just tried my third converter, with no luck. I wired a set of spare lights to the isolater coming out of the bike. They worked fine. I wired the same lights through the converter, with a battery. Tail lights only. I find it hard to believe I got three bad converters. I have to be missing something. I used this 5 wire to 4 wire converter and made the appropriate connections to the corresponding wires from the ISO harness by soldering them and covering the joints with shrink tube. I left enough slack so the vehicle end of the trailer connector had just enough slack to safely connect to the trailer end connector yet have enough slack to allow full lock turning without putting any stress on them, or dragging on the ground. When I'm not hooked up to my trailer and the ball mount is removed, I tuck the vehicle end of the 4 plug connector inside the receiver hitch tube to help protect it. If I still have the ball mount in the receiver, then I loop the connector over the ball mount, between the ball and the rear fender. That looks exactly like I have it. The converters I've used are different brands/models, but are the same description. I bought a fourth one yesterday. I didn't wire it up to the trailer, I thought I would bench test it first. Trailer side to a set of spare lights I have. Ground on vehicle side, to a spare battery. I then went through the vehicle side wires, to the battery. 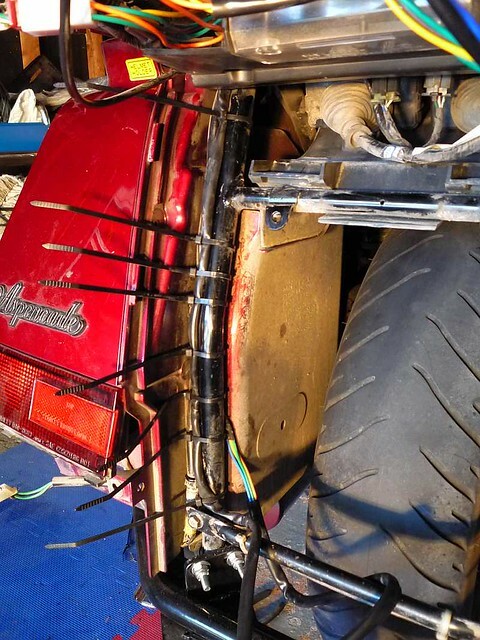 Tail lights worked, but not turn or brake. I've run out of ideas. It can't be 4 defective converters, it has to be something I've done wrong or overlooked. I have heard of people having issues with the Hopkins brand converter. Just telling how I did it and the BRAND of components I used and I never had an issue. If you already have your trailer wired, hook it up and try that instead of bench testing. 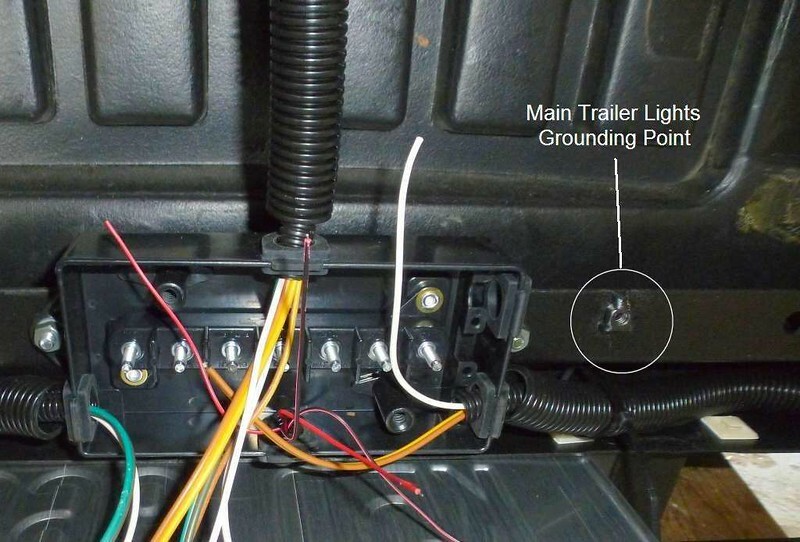 Trailer has the lights installed, but not wired. I was waiting to see if I could get a converter to work, or if I have to add turn signal lights before wiring. I may have to do it though. I've got a message in to Hopkins tech support about bench testing, maybe they'll be able to help. When I get this straightened out, I'll tell y'all about the ring of fire problem I have. It's a good one too. I looked for that u-haul version today. Website says none available in my area. It did say to check the hitch catalog for a bench test procedure. Looked, but couldn't find a hitch catalog. So I got on their chat help feature. That was a waste of time. The guy couldn't or wouldnt do much. Went looking for another converter today with no luck. The email to Hopkins didn't help either. Once he found out I was using this on a bike, he was done. I may have to go to seperate turn signal lights. I don't want to, it's a matter of pride at this point. I know this should work and it's pi$$ing me off. my problem is going from 4 wire connector to 6 wire connector. My Brides Fiat is rigged for 4 wires and I had a very long and hard time getting the wiring harness in behind the bumper faÃ§ade. You have to drop the exhaust and etc. Still no luck. On a bench test, I did get some intermittent results, but nothing to help me figure it out. By any chance do you have LED lights on the trailer? I'm going back to Jobe05's post, convert the trailer to 5 wire and be done with it...that's what I did. Yes me too, had the same thing happen to me, bought 2 different types / brands from 2 different sources and they both acted the same, I could get a tail light though the converter but nothing else on both brands. I will go back to the 5 prong and just wire in a new LED brake light on my new trailer. 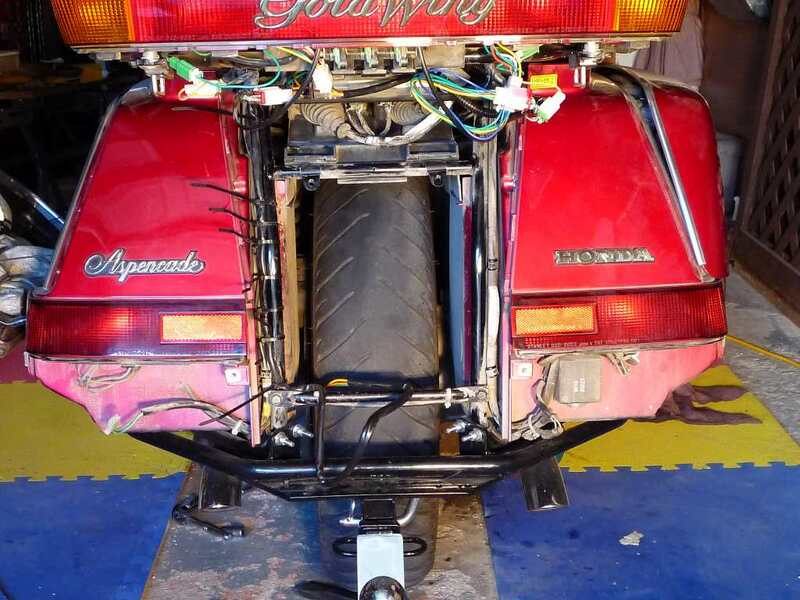 Must be something with the way a Goldwing is wired. I ended up adding two more lights for signals, and using the five wire plug. It still bothers me that I couldn't get it to work. the problem is the isolator and the converter being used together. both are diode blocks. one is fine ,but add the second one and you have problems.. and the problem is load. with the second diode , there is no load on isolator ..
That doesn't explain why I couldn't get the converter to work with just a set of lights and a battery. Multi converters tried like that, and one worked partially, once. I had to get rid of the isolator and the 5 to 4. I just wired direct from each light circuit to the same circuit on the trailer. 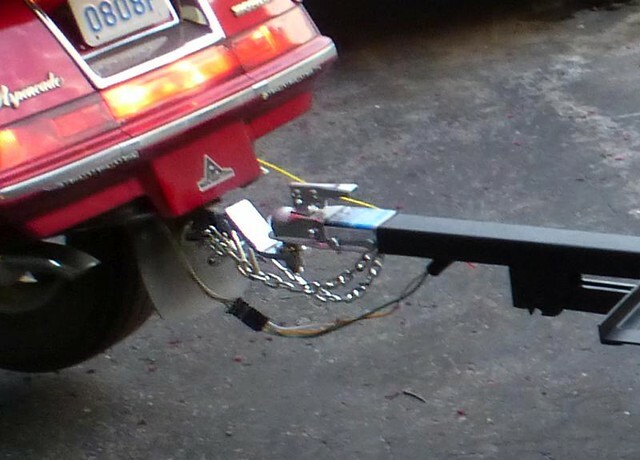 I then added a 6th wire to the trailer and used that to turn on Dedicated Brake Lights. 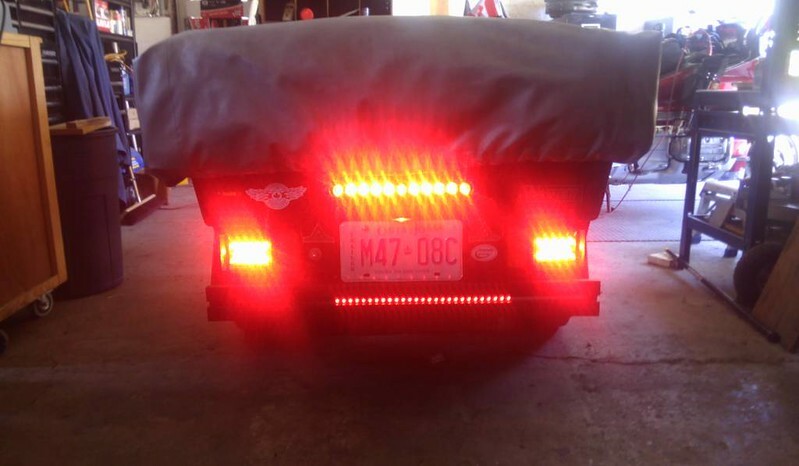 the original brake lights are now just turn signals. Jobe05 was the Mastermind that made it all work, the day after the 5 to 4 and the isolator both burned up into a melting mess. Adding additional lights for turn, or brake is NOT AN OPTION!!!! Think I'll try getting rid of the ISO trailer harness! I don't think you need the isolator at all. the bike's wiring is more than enough for those LED lights. The lights across the trailer top lid, what circuit are those hooked to? 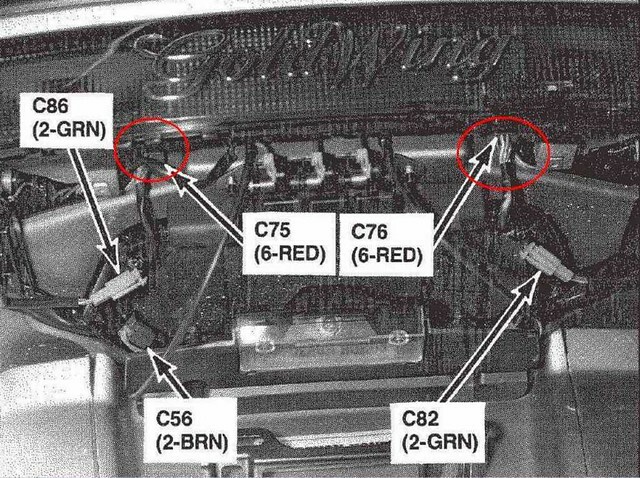 That is where I put my Brake lights.... the lower lights are now just Running and Turns only. 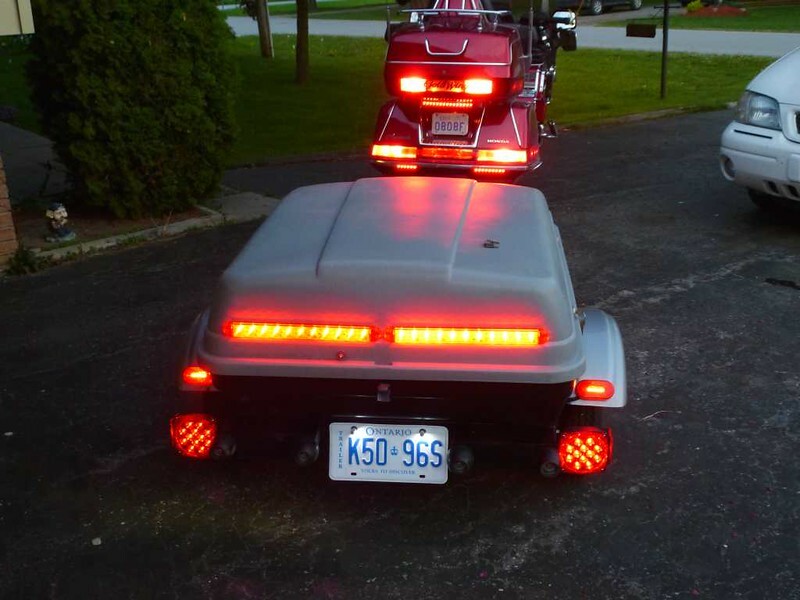 All the red LEDs on the back of the cargo trailer are run/brake/turn lights. I just removed the Isolator harness, wired the 5 to 4 inverter up quickly to the pigtails, hooked up trailer and everything works as it should! Now to unhook everything and do a clean install with solder and heat shrink tubing.